Be the first to share your favorite memory, photo or story of Ruthelma. This memorial page is dedicated for family, friends and future generations to celebrate the life of their loved one. 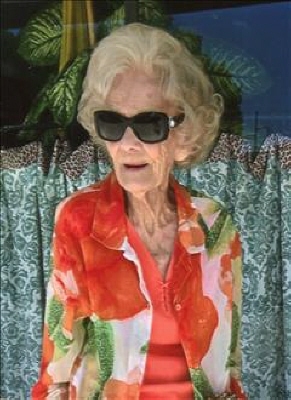 Ruthelma Clifford, 95 year old Woodward resident, passed away on March 26, 2019 in Woodward, Oklahoma. Graveside services will be held at 1:00 p.m. on Friday, March 29, 2019 at the Elmwood Cemetery. Arrangements are under the direction of the Billings Funeral Home. Ruthelma (Carpenter) Clifford was born November 17, 1923 in Nowata, Oklahoma to John Kenneth Carpenter and Ruth E. (Bell) Carpenter. Ruthelma grew up in Vici, Oklahoma and graduated from Vici High School in 1942. On December 12, 1964 she married the love of her life Norval Clifford. The two made their first home in Woodward, Oklahoma. Ruthelma was a telephone switchboard operator at Southwestern Bell Telephone for many years. She and Norval also owned the Snack Shack in Mooreland, the Chefs Breakfast in Woodward, and Ruthelmas Gift Cottage. Ruthelma loved to make something out of nothing. She loved to sew, crochet, and to keep an immaculate yard. Ruthelma loved to dance, it is what gave her the most joy in life. She did not get to dance until she was 35 years old, she then began with tap, jazz, ballet and toe ballet until she was 51 years old. Ruthelma was a member of the Women of the Moose Lodge in Woodward, a lifetime VFW member, and a member of the First Baptist Church. She is survived by many precious friends who loved her dearly, including her best friend in the whole wide world, Lori Freeman. She was preceded in death by her parents, her sister Bonnie, and her husband Norval. Ruthelma was a beautiful, life loving lady, and she brought joy and happiness to everyone that knew her. She was one in a million, kid! In lieu of flowers, memorial contributions may be made to the First Baptist Church(Disaster Relief Fund) with the Billings Funeral Home accepting contributions. To send flowers or a remembrance gift to the family of Ruthelma Clifford, please visit our Tribute Store. "Email Address" would like to share the life celebration of Ruthelma Clifford. Click on the "link" to go to share a favorite memory or leave a condolence message for the family.